Battlefield Hardline’s single player mode has just been shown off over at that there Gamescom, with developer Visceral doling out a generous twelve minute slice of footage ahead of the game’s freshly delayed 2015 release. Though the recent multiplayer beta was a scrappy mess of cops and robbers gone all wrong, this single player campaign looks clever enough, starring a protagonist with the near-magical ability to make baddies surrender using the incredible power of a police badge. Take a look! 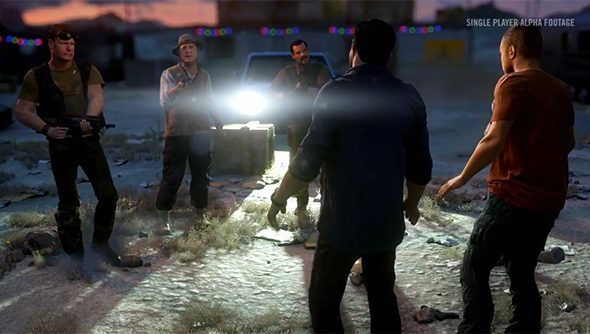 Non-lethal options extend to the aforementioned arrests, which can be carried out on high-value targets to retrieve bonuses, as well as chucking bullet casings and clonking enemies from behind with melee attacks. There’s an odd slew of Ubisoft-scented open-worldliness here too, as you can use special binoculars to survey enemy camps from afar, tagging enemies and carefully planning your approach before you proceed. Arrested baddies are kind enough to remain entirely mute once handcuffed, but once spotted by an armed guard Battlefield Hardline returns to its explosive bread and butter. Barrels explode, enemies duck for cover behind vans, reinforcements arrive in droves. The grappling hook from the multiplayer makes an appearance, allowing the player to reach higher vantage points and, in the example we’re being shown, escape the camp in which you’d been imprisoned by a cutscene just five minutes prior. Visceral’s Steve Papoutsis also revealed two new multiplayer modes for Battlefield Hardline: a car chase one and a hostage rescue one, with the latter being tangentially related to eSports somehow. Here’s a trailer for that, too.